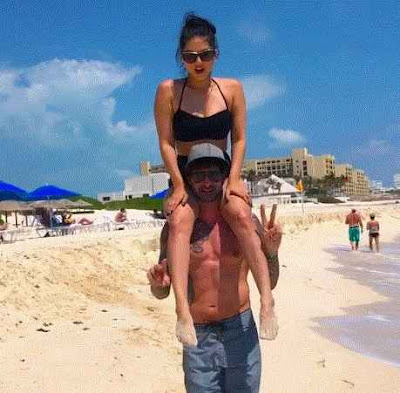 Bollywood actress Sunny Leone enjoys the vacation with her husband 'Daniel Weber' in Mexico. She shared some decent picture for us. Shared picture of his last day celebration on Mexico beach. She tweets and laughs at his statement "Danial got the superb driver' ha ha ha. You get here some stunning picture of both. When sunset started there. Sunny enjoy and compare with paradise. Sunny and Daniel Weber is very popular in India too. Social media always appreciate her love and co-operative couples. She has American citizenship but started her career in India as an actress. Her father was born in Tibet and raised in Delhi. Mother belongs to Sirmaur (Himachal Pradesh). Daniel enjoys with Sunny on Mexico Beach with the unique dress. A good looking picture of Sunny Leone. This is the last day on the Cancun beach of Mexico. She expressed her view that this another rough day of Mexico. Unique dress code gets an amazing picture of Bollywood actress.